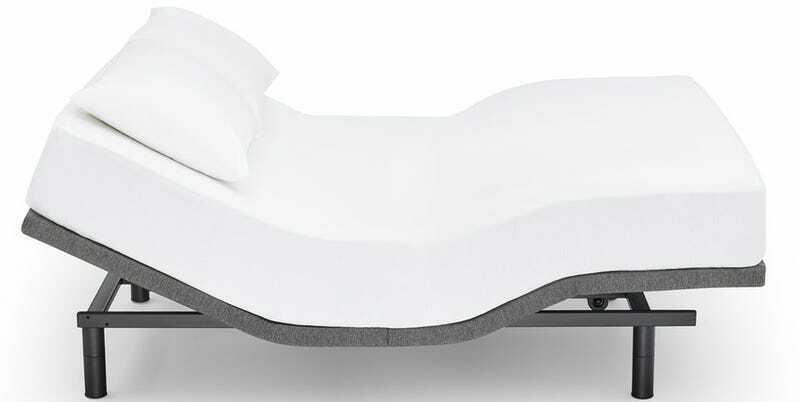 The Casper Adjustable Bed Frame would be a godsend for anyone with limited mobility. For the rest of us, it adds a huge amount of utility to something we spend a third of our life on. The head and foot of the Adjustable Frame move independently and both go way further forward or up respectively than you’re expecting- max out both and you’re practically doing a stomach crunch. Movement is faster, smoother, and quieter than I was expecting. The frame is adjustable to three different heights that I’d describe as “crazy high”, “normal”, and “basically on the floor”. At the middle height, small pets and robot vacuums will be able to navigate under the Frame without impediment. At a grand for a Queen, the Adjustable Frame is obviously not a cheap product, and given that that size weighs over 150 pounds, it’s great to see Casper maintaining their 100-night trial offer across this line as well. You may notice a steep price and weight jump going from Queen to King, and that’s because the King Adjustable Frame is actually two Twins, and yes, if you have two Twin mattresses you can move both sides independently. If you’re using a King mattress with the King Frame, it’s easy enough to sync one remote to control both frames, with no noticeable lag. The Split King Frame also means two power bricks and plugs, so you’ll be doing some under bed cable management. Speaking of that remote, it’s the weakest part of this premium package. It’s not something that’s going to impact your enjoyment of the product in any significant way, but it’s 2018 and this remote takes 3 AAA batteries. There’s no button to take the whole bed back to flat, the shape of the remote isn’t informed by ergonomics or button layout, and there’s no app, built-in lights, built-in USB ports, etc. While the instruction manual is counterintuitive, putting together the Split King Adjustable Frame, even with its combined weight of 226 pounds, was nothing compared to say, IKEA. I’m testing the Adjustable Frame with the Casper Wave which I’ll be writing about shortly, but the Frame works with any foam mattress you already own. It’s OK to admit that you probably watch TV, work, and/or eat in bed more often than you should, and all of those activities are made significantly more comfortable and ergonomic by the Casper. If you have real problems, like heartburn, snoring, or back pain, the Adjustable Frame may be a game changer for you. The Casper is the only adjustable bed frame I’ve slept on, but it isn’t the only foam mattress compatible option out there. Skimming over the competition, the Casper appears to be in line on pricing, the most minimalist option, and way ahead of the majority of the competitive set with its 100-night trial.